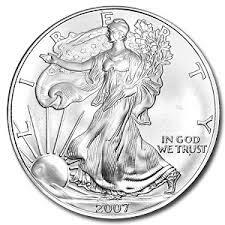 American Silver Eagle Coins are the most popular Government minted silver bullion coins in the world. Silver Bullion is defined as .999 pure. This means it has impurities of less than .001 percent. The Silver American Eagle Coin has a nominal face value of one dollar. It is actually worth the price of one troy ounce of pure silver and an additional premium. The premium varies based on supply and demand. 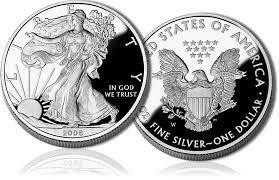 The US mint usually runs out of American Silver Eagle Coins in the Early Fall. It will not release the next year’s mintage until the first few months of the following year. First Strike Eagles are released through one of the Major grading services. These are encased in plastic and have their own unique registration numbers. They are called “First Strike” because they were minted first off of the new plates. Proof Silver American Eagles: Proof coins are struck multiple times on specially prepared planchets to provide a unique finish that collectors praise and value. Mint State American Silver Eagles: Mint state is a condition given to coins at a certain level, between MS60 and MS70, on the Sheldon Grading Scale. Mint state coins have never been in circulation so when buyers get these coins, they are buying a coin in the same condition as originally produced, or very close to it. The closer the coin is to the “First Strike” the lesser the wear on the die and the clearer the images. All American Silver Eagles are sold in Uncirculated condition by the U.S. Mint. They are packaged in tubes of 20. Like those pictured above. The mint does not sell individual tubes or Eagles directly. All Eagles are sold by the US mint as in the well known Green “Monster Box”. Monster Boxes are sealed by the Mint before they are shipped. Each one contains 25 tubes of twenty silver eagles. That’s 500 total. Resellers are free to break open the boxes and sell individual coins or tubes. If you own a Mint sealed Monster Box, leave it sealed! Get a Quote on Uncirculated 1 Ounce .999 Pure American Silver Eagles! Best Price Anywhere on Uncirculated Silver American Eagles! How Many 1 Oz .999 Silver American Eagles Are You Interested In? Are You Also Interested Our IRA & 401K Rollover Options? We Offer a Self-Directed Physical Precious Metals IRA where you can store locally in a fully insured facility.